This week we sent prayers as Madalin underwent a surgical intervention at Pitesti Paediatric Hospital. The doctors have mounted a ureteral stent hoping it will have a favourable effect in the long term. The Centre’s staff, together with Madalin’s Mum were by his side during these challenging moments and anxiously await his return at the hospice. We hope the procedure will be a success and that Madalin will continue to thrive at Saint Andrew’s centre surrounded by all his friends. As our kind readers already know, Madalin has a complex diagnosis and his daily routine requirements and medical needs are specific and he needs constant monitoring and specialized treatment to address his problems. 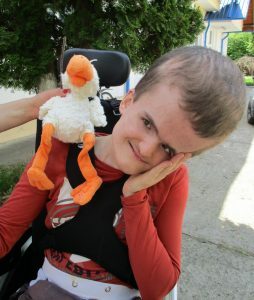 Despite these shortcomings, Madalin continues to delight us with his smiles and giggly personality and every day at the centre brings new happy moments spent in his company. Sending you some photographic evidence of his bubbly personality and his broad smiles to brighten your day.